RN-450: The precision of these radial arm saws is identified by the following characteristics: Saw carriage slides on 8 bearings, having dust scrapers which guarantees complete cleanliness of both the interchangeable steel tracks and the bearing. Self-centering locking in the main angles position of the arm, the motor and the carriage with the possibility of manual locking at all intermediate angles. Easy and extremely practical unlocking of the arm rotation on the front. Swiveling and tilting on the vertical and horizontal axes. 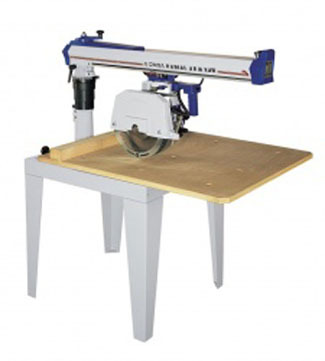 These machines are especially suitable for furniture manufacturers, frame makers, sawmills and carpentry shops. Standard overload protection with no-volt coil, automatic head reversal and motor brake. 35" x 35 " x 43"